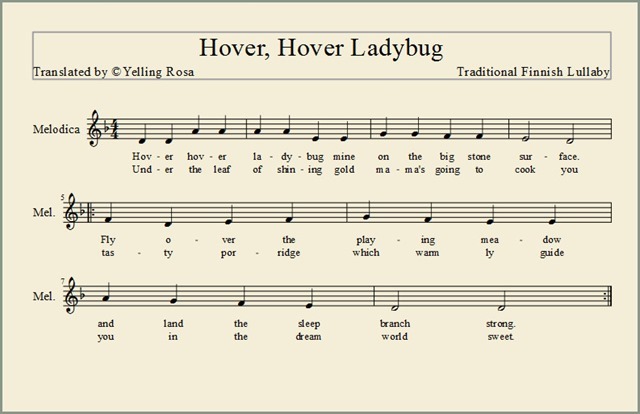 “Hover, Hover Ladybug” is a Finnish lullaby. It has been singing for ages. In my English version I have concentrated on beat instead of a word by word translation. 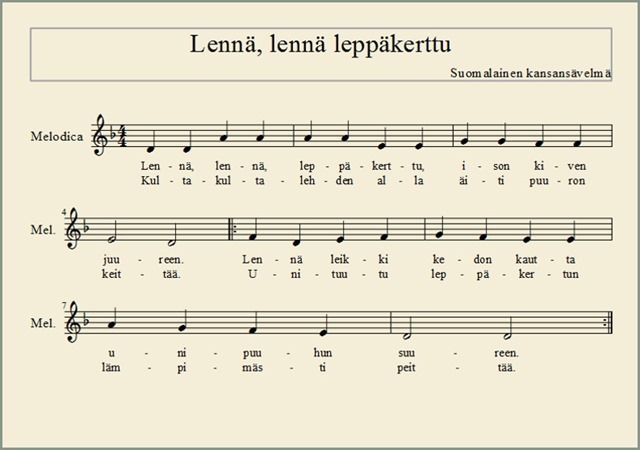 I sing this song without the accompaniment because it is the way how lullabies have performed in Finland. You can listen to “Lennä, lennä leppäkerttu” (Hover, Hover Ladybug) here. I wish you enjoy listening to this song. My grandmother used to sing it for me when I was a child. I have tried to find the gentle atmosphere she was able to conjure. Ps You can enlarge the sheets to the new tab by clicking them with your mouse cursor. This entry was posted in Literature, Music, Society. Bookmark the permalink. So sweet. Very nice of you! Thanks so much for this humbling lullaby, I enjoyed it. Unusual and nice. Thank you. I did enjoy listening to this song. You did a nice job singing. The sound would be a good lullaby tune. So sweet and relaxing !!! Thank you for sharing this beautiful song. I found your singing really compelling. How fun! Great idea for a post. I like it! Thanks for sharing the song. Very nice. I enjoy a capella music.I featured an amazing School Choir on my blog recently, without musicians. My grandson would go to sleep nicely to your voice. Thank you for your comment. I am happy to hear that this little song appeal to you. Well that was a neat little song! What a great melody and soothing voice… Love the sound of the Finish language, very, very well done, puts me in a great mood. Thank you very much. I am happy that this little song appealed to you. Resonance resonates without the need to understand the words – very beautiful. Thank you for your comment. I believe that this song does wonders because of its soothing effect as you said with other words. Thank you very much for your comment. I know that there is at least one more verse for this song but it is hardly ever used. It is a custom that these two verses are repeated. Next I will translate my first single record in English. You can listen to it here. After that I could perform some other Finnish lullaby/folk song with the English subtitles but I haven’t made any decision. That would be great, I’ll make sure to check it out! Veeery nice! Like a mantra. Thank you very much for your comment. It is true that this little song is like a mantra. Perhaps that’s why it is repeated several times instead of singing many songs in a row when a child is lulled to sleep. Beautiful! Thank you for sharing this song! Thank you for wishing me a nice Easter. Vă mulțumesc pentru comentariu. Vechi ca dealurile. Paste Fericit! It’s a fine little song. Very sentimental for me, brought a tear in my eye. Childhood memories. Good ones. I am happy to hear that. I believe that there aren’t many Finnish children who haven’t slept to this song at least once or so. And Ann from Stockholm told on her comment just after you that this song is called Leppatriinu in Estonian. By the way my father and two brothers live also there in Florida. Note for others: Nukkumatti is the Finnish name for the Sandman. I have Estonian parents, Ladybug, is called Leppatriinu in Estonian. Thank you for your comment. Yes Finland and Estonia have much in common, starting from the language. Leppa is leppä but what is that triinu. Google translator didn’t know. Perhaps it is just a name, which is used when a child is cherished. I have studied one year Estonian but I have forgotten almost everything. So lovely. You must have wonderful memories of your Grandmother and this song. Thank you for your comment. Yes this song reminds me of my grandmother and my childhood in a pleasant way. Siempre envidio a los habitantes de las frías tierras nórdicas por su ductibilidad para los idiomas: es como compensar la falta de calor con un rayo de inteligencia superior en el alma. A mí ya me gustaría escribir literatura en un idioma distinto del mío. Felicidades. Tus poemas son preciosos. enhorabuena! Thank you for the encouragement. It’s not so bad to live here even though our waters are still covered by ice here in the northern Finland. If you like the look at the Good Friday Photo, you will find it here. PS I hope you don’t mind that I reply in English. I understand Spanish but writing is almost impossible for me, imposible para mí, or how does it go. It´s all right and even encouriging for me that you can´t write poetry in my language. I´ll take a look at your Photo and I will also follow your blog. What a lovely lullaby! I agree that it’s very soothing. I think traditional lullabies are no longer sung that often here in the U.S., which is unfortunate. I do remember singing “Mockingbird” to mine. Old traditions are fading away all over the world. It is a sad thing because the local old culture isn’t replaced by the new local traditions as it has been for ages before this. The traditions are real when the conditions have created them. On the other hand, this commercial global trend hasn’t been going on very long time, less than 100 years, so we can’t know if it will be replaced with the down-to-earth habits again in the future. PS I know that Mocking Bird, if it is the same song as Hush, Little Baby, because I have American Folk Songs Notebook which is compiled and edited with Notes by Alan Lomax. I got it in 1969. Yes, you are so right about old traditions, although I suppose there are new traditions and songs. And yes, the song is “Hush, Little Baby.” I was not thinking clearly when I replied earlier this morning. Carly Simon and James Taylor did a more rock version in the 1970s, I think, and they called it “Mockingbird,” but I prefer the folk versions. Very nice melody. I’ll try to play it on clarinet later. And thanks for stopping by my blog! Thank you. I am happy to hear that you are going to play the song with your clarinet. Stopping by your blog was my pleasure. Thank you for your nice comment. Likewise it is nice to meet you. All the best for you. Pohlazení duše člověk potřebuje nejen v dětství ale i ve stáří, děkuji za ně, ze srdce, čtení u vás, je takové hlazení po mojí šedivé hlavě. Děkujeme za Váš komentář. Jsem rád, že můj blog článek apelovat na vás. Hello, Yelling Rosa! Thanks for visiting my blog – and I really enjoyed this post! My grandfather emigrated from Finland to the US in the 1930s (I believe)… my poor dad started school in America not speaking a word of English 🙂 Sadly, he never passed his language along to us. Maybe it was considered the “old people’s” talk when I was born in the 60s, but all the older ones in my extended Finnish family spoke it. In any case, how lovely to make contact with a fellow Finn… I love the minor key of this lulabye as well. Beautiful and haunting. I will try to learn it. Thanks for sharing the lullaby. By the way, I love ladybugs! Thank you very much for paying attention to my blog. I do appreciate it but I have decided that I don’t accept awards because I feel that they require regularity and publishing tempo I am not able to keep up with. English is not my first language so the blog posts, poems and replies are a great challenge for me. That’s why I publish an article only every month. More than this would weaken my chances for holding this standard up and it would’t be good for anyone. What a soothing voice you have! Thanks so much for singing the song and giving the English translation! This is lovely, thank you so much. Thank you for the encouragement. I’ll try to keep it up if you do the same. All the best for you! Thank you , i’ll try my best too 🙂 take care . Very moving song ! I traveled across my childhood for an instant. Thanks ! Thank you so much for your visiting me and of course for this song. Thank you. No problem. My pleasure. Have a nice weekend! thank you . this was lovely. Thank you for listening. I am happy as this little song appealed to you. Have a nice weekend.